Nowadays almost anyone can start a blog. When visitors come to your blog, chances are high that they will leave soon after scanning through the content on your blog. So, how do you make the traffic to your blog stay? Here are 6 tricks that you can do to encourage your visitors to stay and better still, come back to your blog regularly. If you have more suggestions, feel free to share them in the comment section. If you have testimonials from your subscribers, add them in the header, sidebar and/or footer of your blog. This will immediately differentiate your blog from thousands of other blogs out there. If you have a list, getting testimonials is as easy as sending an email and ask. If you don’t have a list, you can get your friends or other marketers you know to give you a testimonial. If you are comfortable sharing your photo in the public, you can add a photo of yourself on your blog, with a short description of why you start the blog. You can also add an ‘About Me’ page and make the link obvious, either in the header or footer. People are always curious about what other people are doing, why they do it and how they do it. By adding a photograph of yours and telling people about you and your story, you are able to quickly gain trust from your visitors. As a result, they are more willing to find out what you have to offer. People come to your blog for information. Once they get the information they want, they will move on. The question is, where do they move on to? If you do not intentionally do anything, chances are high that they will move on to another website. To prevent them from leaving your website, you should always add an end-of-post offer. An end-of-post offer is basically an offer that is presented at the end of your article. It should be the first thing they see when they are done reading your article. – It can be an offer to download a free ebook. – It can be an offer to opt-in to your newsletter. – It can also be simply links to other interesting posts on your blog. You can add an end-of-post offer easily using our free tool – PopupXpert. Most bloggers list down their recent posts because it is in the default setting. The problem with recent posts is they may not be interesting enough to arouse your new visitors’ interests. To show your new visitors the potential of your blog, you have to show them your best posts. 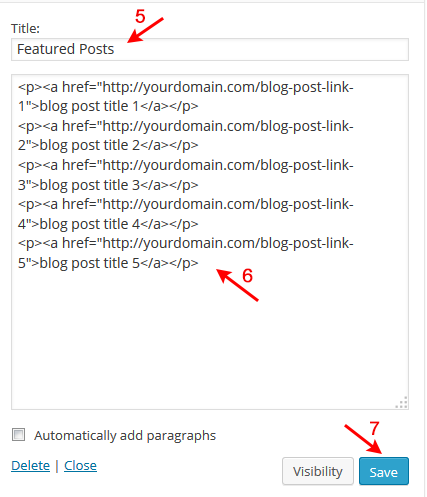 c) In the input form, enter ‘Featured Posts’ in the title field (arrow 5 above) and the html link codes of your top 5 posts (arrow 6 above). Click Save (arrow 7 above). The basic idea of adding images and videos to your blog is to make your visitors believe that your blog provides values. When new visitors first come to your blog, they are skeptical. They often scan through your blog before deciding whether to read your article. Images and videos require more effort to prepare, hence making them to believe that your blog is worth reading. Last but not least, you can differentiate your blog from the rest by providing online services in your niche. The best example to show you is our LeadsLeap blog. Other than blogging, we offer a slew of tools and services that our members can use free. Yes, it takes time, money and ideas to create useful tools and services. But it’s definitely something that will keep your visitors coming back to your website again and again. Agree? Don’t agree? Or have I missed out some ideas? Feel free to share your thoughts in the comments below. Great set of tips. I’ve recently started adding videos to my blog to increase the staying time. The good thing here is that ANY related video will do and YouTube abounds with them, no matter what your niche. However, I’ve recently discovered Powtoon, a place where you can make your own cartoon / presentation videos for free… other sites are available, but I haven’t discovered them yet. For the rest, here is the link: http://www.powtoon.com. As always i can’t get enough from your articles, and i really liked the powtoon site. thank you. This is a vary great article about traffic. Yes we all want traffic to what were all promoting. Thanks for the info. to pass on. Thanks for the good advice on blogging.Not only do you need to supply good content,you also need to be blogging on the right blog platform.. Excellent tips to use immediately, I really liked that adding a tab with content about me, the photo and what I have. Very good article there are several things that I will apply immediately. Thanks Author for your hard work, you really bring innovation in my knowledge, you think out of the box !! Hello Kenneth, Powerful Tips men!! The content of your blog is very important. It is the reason why people visit your blog. Try to make your blog interesting and learn to master the ideas included in your blog. your RSS feed. Nowadays, the flow of your content is real-time and the RSS allows you to show your content to a wider audience. All I know is that I will never even look at a site if I receive a pop up. Hi Rich, I believe you are referring to obtrusive popup that is shown before you even see the website. Popup comes in many forms and it can be non-obtrusive. Read our post The Dos and Don’ts Of Using Popups. Good post i like it.it is better ideas how to get traffic one of another idea engaged community people through social media etc. Getting website visitors to stay on your site for a while is very important. Thanks for sharing this very informative post. The content is KING and it will always be a KING. So I think we should focus on creating valuable content and then analyze what kind of content is getting engagement and traffic. That’s right, Yogesh. That’s the direction LeadsLeap advertising is moving into also. i want to improve my visitor, but i only user blogger, so thats is same with wordpress ? These they type information are very rare found. I hope you will in future posts these type of article, Getting website visitors really important to me, thanks. nice article! This is a vary great article about traffic. Yes we all want traffic to what were all promoting. Thanks for sharing. Great tricks! I love the community and immense value offered in LeadsLeap! Thank you for all! fadhil , I’ve done way elevates visitors to my blog and it works thanks. This is the help that a lot of internet marketers are missing from their arsenal for sure. Every blogger should read this post and apply them in their blogs. This will boost traffic to their website. We also develop SEO optimized content for websites. Great post! I’m digging that popup generator. Looks like it has some flexible options and will be effective in capturing some more leads. Have you done a case study on it? Also, adding testimonials to a blog is a very clever idea, and you’re right, most bloggers are not doing this…at least I have rarely seen it. Great post, i have been looking for such a page that is so helpful and interesting. Keep up with the good work. If you need good traffic to your website, you have to work for it. People won’t visit your website if you don’t have relevant content in it. There are a million websites on the internet now. If you need people to visit your website, you have to make sure you are posting good content. traffic can be generated on your website through proper social media marketing. It can also be generated by doing white hat SEO. If you want traffic to stay on your blog, then your content of the blog should be relevant. btw thanks author for sharing this with us. Great suggestions there. Adding about us (or about me) page is always a big plus. People know who they are interacting with. They even think they already met you and know you. Testimonials adds a personalized feel. Those that appear in the list will feel a part of your program. what will an exposition help benefit give? Notwithstanding syntactic remedy, you will discover coursework help, for example, making pre-connected substance pages, altering heading and content designing for lucidity and appearance, embeddings arrangements of figures and tables or graphs, and the headers and footers which will reference the list of sources toward the finish of the scholarly exposition. Good learning material you have provided. The points you have shared I will apply to the blog to retain the traffic. Hope it will work for me.